Participating in physically challenging events with other breast cancer survivors was an important part of my recovery process. Getting my strength back by training was a healthy, attainable goal for me. I ran in the Susan G. Komen Race for the Cure, hiked in The Breast Cancer Fund Peak Hike (up Mt. Tamalpais in California), and climbed Mt. Fuji as a team member of The Breast Cancer Funds. 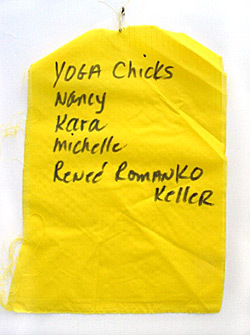 This flag bears the names of women I knew with breast cancer; it was attached to my backpack, in their honor, during the Peak Hike.